As national attention was focussed on the recent deaths of 18 children over three days in Ahmedabad's main civil hospital, officials said most children were underweight and thus vulnerable. Up to 39 percent of children in Gujarat are underweight -- the national average is 35 percent -- compared to 16 percent in Kerala, 21 percent in Punjab, 23 percent in Tamil Nadu and 36 percent in Maharashtra, according to the National Family Health Survey 2015-16, the latest available data. Among 29 states, Gujarat is India's second-most industrialised state by gross value added, its state gross domestic product is fourth-highest in the country, and it is ranked fifth by per capita income, according to government data. Smaller states such as Mizoram (11.9 percent) and Manipur (13.8 percent) and bigger states such as Kerala (16 percent), Punjab (21 percent) and Tamil Nadu (23 percent) have lower proportions of underweight children. 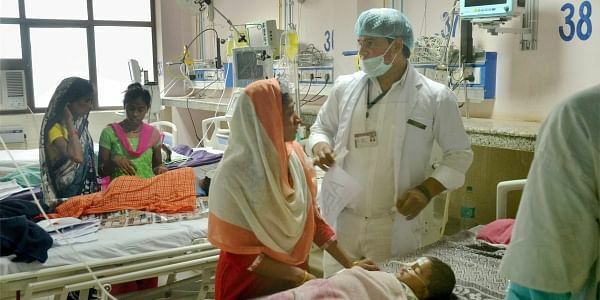 Jammu & Kashmir, with a per capita income of Rs 60,171 - 50 percent lower than Gujarat -- has lower infant mortality (26) and under-five mortality (28). India has reduced its IMR by 68 percent in the last 41 years from 130 in 1975 to 41 in 2015-16, data from the National Family Health Survey 2015-16 reveal. This is still worse than poorer neighbours such as Bangladesh (31) and Nepal (29).